I felt most ‘out there’ while in Laos. While it wasn’t difficult to get around, find a place to stay or a meal, it was definitely one of the more rustic places that we visited. 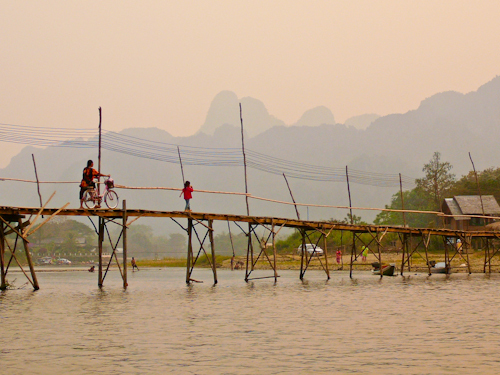 There were several bridges like this in Vang Vieng; not only used by pedestrians and bicycles but also by motorbikes! We spent plenty of time back in those mountain-like karsts in the background, scooting around on our motorbike exploring the caves, waterfalls and villages. PS…come on over to the OneGiantStep Facebook page and give us a ‘Like’!